With just a little forethought, tonight’s dinner is easily accomplished. Geena and I are getting back to meal planning on Sundays and with a grocery, meat and fish list, great meals are really only 30 minutes of prep time. Grilled salmon and peaches is a 30-minute prep meal. Begin by brushing both with olive oil and let them come to room temperature. Add Grand Marnier and some Allspice to the peaches for added flavor. Plan to stop and pick up salmon on the way home from work. You will also need two peaches, quinoa, mint, a couple of carrots, celery, cucumber, asparagus and plain yogurt. 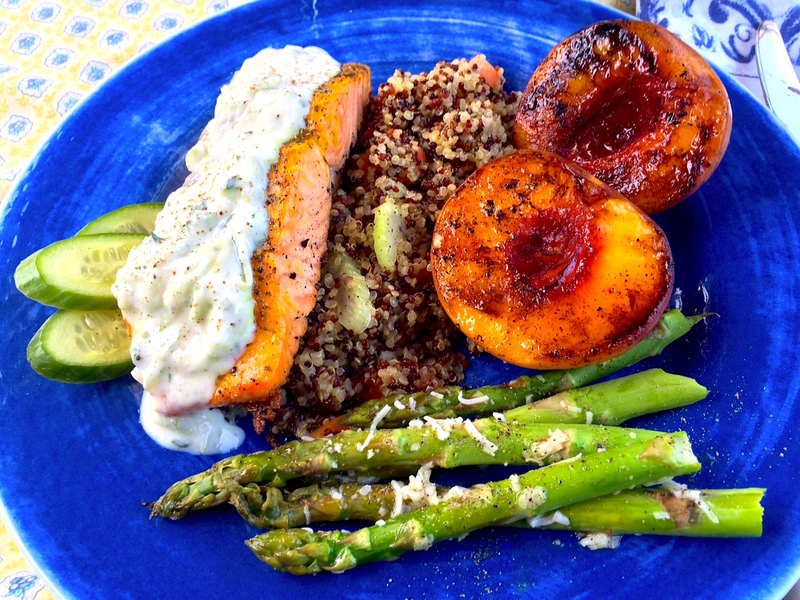 Dinner tonight: Grilled spiced salmon with homemade raita dressing, quinoa, roasted asparagus with Romano cheese and grilled peaches. The trick to great salmon is brushing it with olive oil, adding cracked pepper and a touch of salt. Lightly drip olive oil over the peaches, add Allspice and drizzle (the secret ingredient) Grand Marnier before grilling. The salmon takes about 8 minutes while the peaches about 6 minutes. It is a good idea to sear both but then grill them off the heat and bake them, allowing the wood and briquets to fill the BBQ with its great smokey flavors. Salmon most often will call for a Pinot Noir. Tonight we choose a Cardwell Hill Cellars Pinot from the Willamette Valley in Oregon. A great, healthy addition to this meal is quinoa. We added chopped celery and carrots to the quinoa at the very end to add a crunch and to ensure they stay crispy. The sauce or dressing on the grilled salmon is a homemade raita dressing. The cucumber dressing is a favorite in India and is built on a plain yogurt base. Add garlic, shredded cucumber, mint, cracked pepper and a teaspoon of salt. It is a good idea to refrigerate this mixture for an hour before adding to the grilled salmon. The raita is a great topping as its crisp acidity adds interest to the rich flavor of the salmon. This works well with the spice and smokey char of the grilled fish. This one dish meal is perfect with a Pinot Noir. 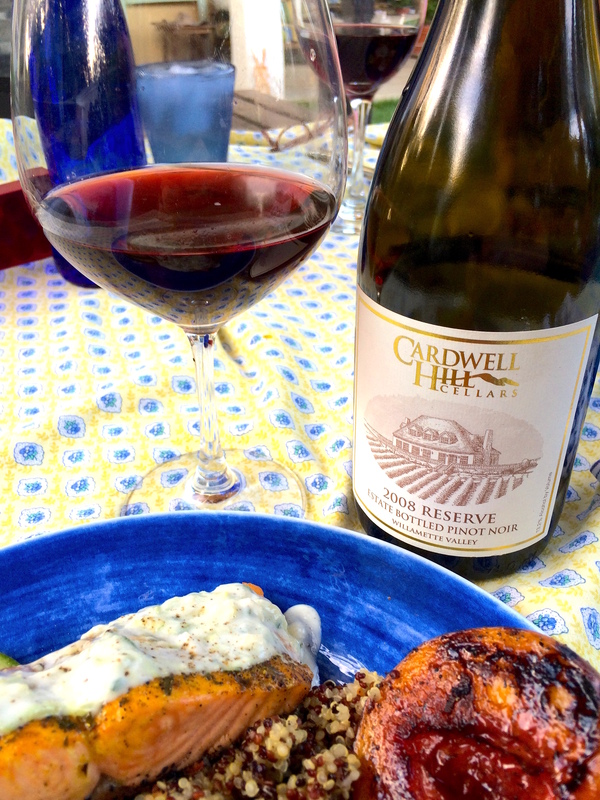 We chose Cardwell Hill Cellars 2008 Reserve Estate Willamette Valley in Oregon. Contrary to what others have said online, this Pinot is a winner. I imagine it just needed more time in the bottle to “grow up.” This is a three-clone French-style Pinot Noir: Silky smooth, dark bing cherry earthiness and spice with vanilla and caramel notes. So pretty, light and clean. This can easily be enjoyed by itself or with grilled fish, roast chicken and pork chops. Loved it! If you missed my last post, check out the August 4, 2015 post, Grilled shrimp appetizers and Cooper Rose. Be sure to return check out my Twitter @TalesoftheCork and on my Instagram (talesofthecork) daily postings. Please take the time to find me on Facebook as well at Facebook/TalesoftheCork. I also would covet those who would suggest a wine, restaurant, chef or hotel to visit. Feel free to contact me through social media or via email at talesofthecork@gmail.com.